Olive oil is clearly worse than butter, but the media’s got bad news for those who have made the wrong choice about which form of grease to cover their bread with. An especially crappy year of bad weather and bacteria have sent every other news outlet panicking after the prices went up, like, a little bit. If you’ve noticed your news feed cluttered with headlines about an impending olive oil crisis, it’s because olive oil prices have been rising, at the same time that bad things have been happening olives. The context you may not have seen is that bad things frequently happen to olives, and the prices seem to rise in step every few years. If you’re in America reading this story, you don’t need to freak out at all—you will probably not see a cost increase. Prices for extra virgin olive oil in Italy have soared almost one-third since October to €5.75 ($6.15) a kilogram, while Spanish costs jumped about 10%, according to the International Olive Council in Madrid. The forecasters at Mintec Ltd. in England see room for even further gains. Other reports seem to show equally bad-but-not-really-that-dire situations. The International Olive Council reports that refined olive oil is around 10 to 15 percent more expensive in Italy and Spain than it was last year, while extra virgin olive oil prices in Italy saw a 70 percent increase from 2016 to now. The AP also reports a similar 64 percent hike over last year’s prices in Italy, but that would only translate to a 10 to 20 percent increase on the bottle—so a 30 dollar bottle might cost 33 to 36 bucks. The price hikes are not expected to be even that severe in the United States. People are freaking out a lot, but this exact same thing happened in 2015 after drought in Spain and heavy rains in Italy jacked up olive oil prices as high or even higher than they are now, according to the International Olive Council. And I feel bad for the individual olive growers, and get that people like olive oil despite the fact that lard, butter, and bacon grease taste way better. But don’t panic! Most people aren’t expecting some great olive oil catastrophe. 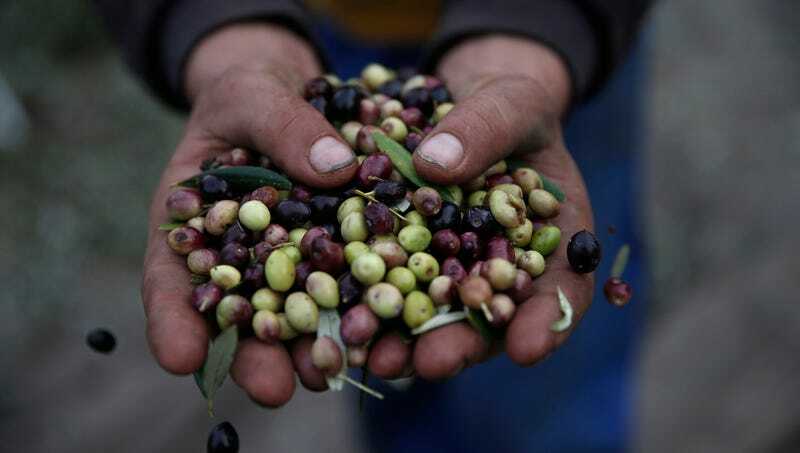 “With global stocks down just 14 percent, no one is predicting general olive oil shortages, even with a 75 percent increase in consumption of olive oil over the last 25 years as demand pushed into non-traditional markets,” the AP reports. Or maybe do panic! Others say a global shortage is on the horizon, because no one really knows. Indeed, no one really knows is the theme of this entire scare. Mainly, people are saying this was another bad harvest year. Bloomberg and others blame volatile weather in the biggest olive growing regions, Spain and Italy. Others are blaming bacteria; for example, the Xylella fastidiosa bacteria has been killing Italian olive plants—an article in Scientific American claims a million Italian trees have been ravaged by the disease. Then again, this bacterial outbreak has been an ongoing problem for around four years, a period during which olive oil prices went down and back up. Olive fruit flies are also reported to have proliferated in the volatile weather, and their maggots eat olives’ insides. All of the issues folks are pinning the latest price hike on seem to happen pretty frequently. But no one remembers that, and folks write news stories about it like the long-awaited olive oil apocalypse has finally arrived. Inevitably, olive oil prices seem to be linked to the weather, and bad weather will mean bad harvests. So in short, olive oil will be a little more expensive for a bit, and here in America we will probably not notice a change. Olive fruit flies should better controlled with pest management. We need to do something about Xylella fastidiosa. We also need to do something about climate change. Worry about all of those things before you panic about the price of olive oil.